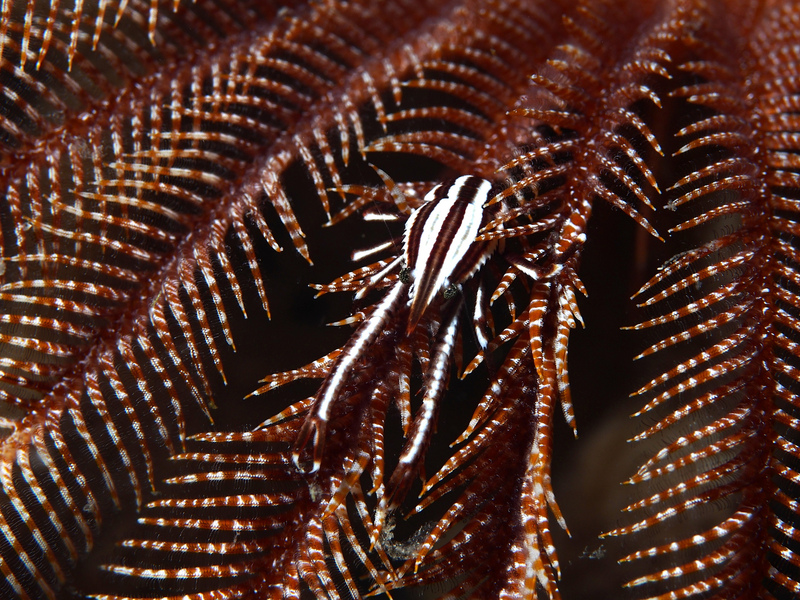 The Crinoid Squat Lobster, also known as the Elegant Squat Lobster, is a squat lobster from warm, Indo-Pacific waters. Females are slightly larger than males but at less than 2 cm (0.8 in) long, they're still tiny. 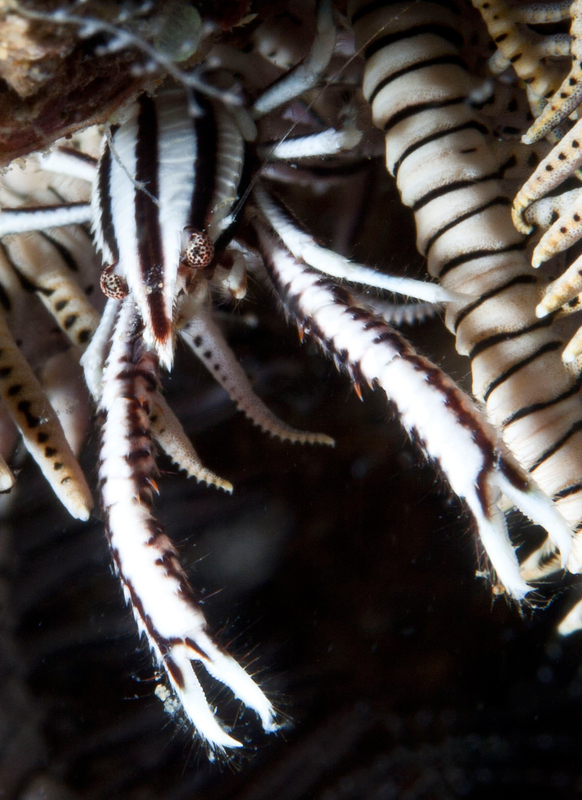 They can survive on their own, scrabbling around in search of food, but their prospects greatly improve if they can get their claws into a crinoid. 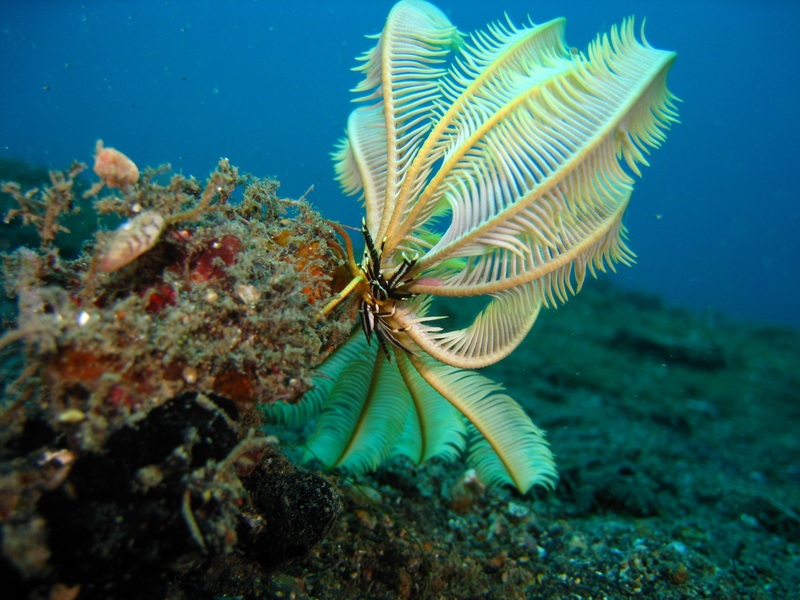 Crinoids are bizarre echinoderms who look like a bouquet of feathers firmly attached to the sea floor by a collection of what look like roots. The feathers are really arms used to collect tiny, drifting plankton. The feathery shape provides a greater surface area, and a kind of gutter full of sticky mucus runs through the middle. Plankton gets trapped in the mucus and the crinoid slowly drags the whole lot down into its mouth at the centre of the feathers. Crinoids don't move much but when they do, it's always to try and get themselves into a position where there's lots of plankton drifting around. 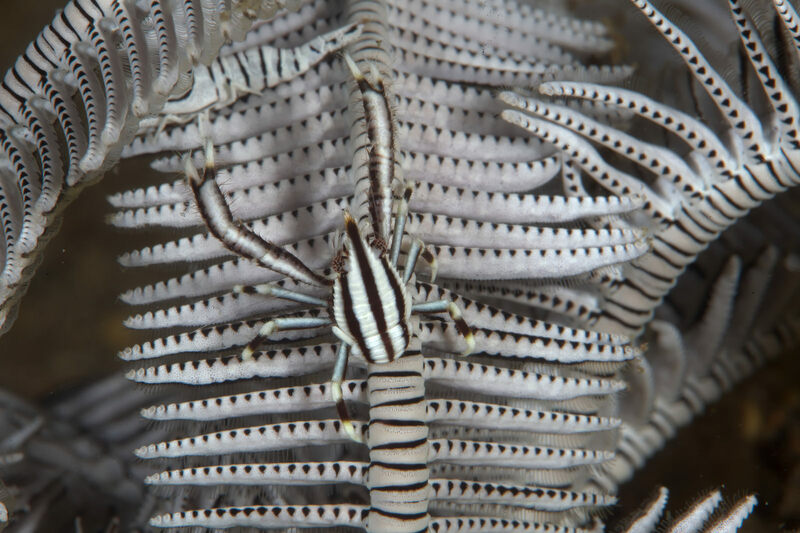 For Crinoid Squat Lobsters, this is ideal. 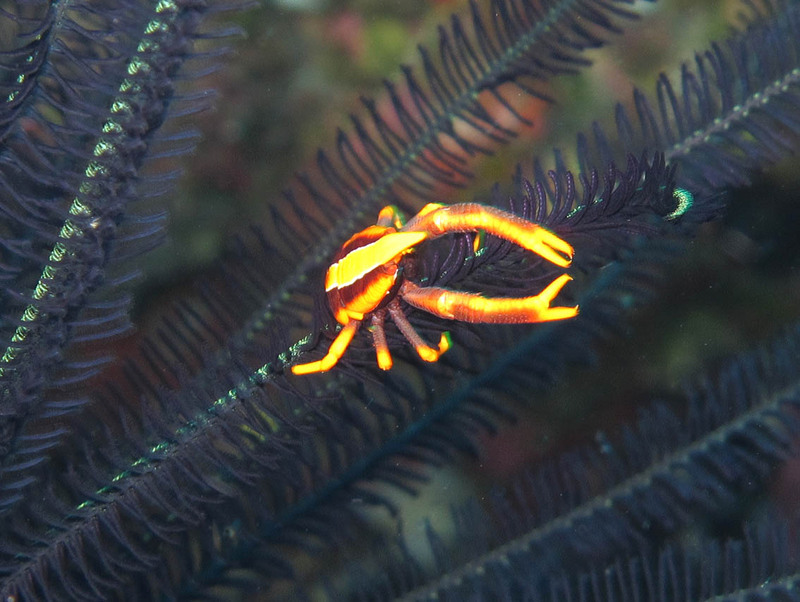 They climb up into those crinoid arms and intercept some of that delicious plankton before it can reach the crinoid. 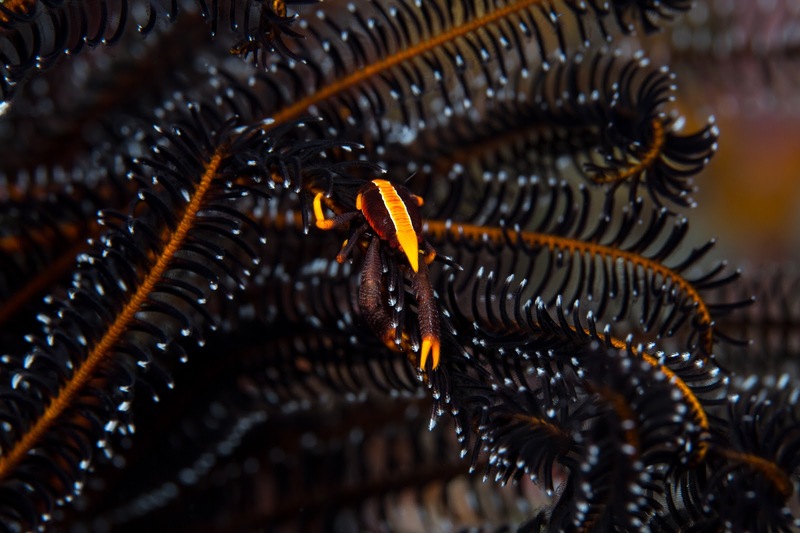 Crinoid Squat Lobsters come in a vast array of colours. Usually they bear light and dark stripes that camouflage them as they cling on to their host. Although it doesn't always work that well. It's good when it does, though. Crinoids are almost nothing other than skin and bone and few predators interfere with them. This is great stuff for our squat lobster! It's like living in a house which purposefully situates itself in a plot of land where bread and chocolate bars mysteriously fall from the sky every morning. And what does the crinoid get in return? Apparently, nothing whatsoever! There goes the line between "chum" and "chump". a little too spidery. eek! Definitely the best dressed parasites I've ever seen! @TexWisGirl: Spiders with massive eyes AND claws! @Jacob Littlejohn: Haha! That's a good point!